The Association for Downloadable Media, an industry group focusing on podcasting and new media, today unveiled proposed advertising standards for use with downloadable media. The proposed ad units are offered with an eye toward making negotiations smoother between content creators and advertisers. 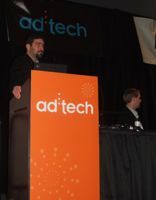 The proposed standards were presented Wednesday morning in an ADM forum at the ad:tech convention in San Francisco, by a panel of people who helped develop the standards. Sean Cheyney, CMO of AccuQuote. The talk was moderated by Bryan Moffett (pictured), Director of Ad Operations, Natl Public Media, and ADM Membership Committee Chairman. The draft ad units cover a range of standard advertisement sizes and types and formats, and also include a “collaterals” category, for other podcast advertising “real estate” not necessarily covered in the other unit definitions. He explained that he has bought ads in podcasts, sold ads in podcasts, and so on, but across the many podcasts, among many different sponsors, there were lots of different advertising options â€“ and the potential for lots of confusion. The Ad Standards Committee and the Ad Council sought to come up with some podcast ad-unit guidelines like those of the Internet Advertising Bureau (IAB) for its display ad units. Their “rules” in developing these standards were to keep options alive, exclude nothing, knowing that different people will use different methods and so forth. The group strove to make any standards they developed simple (easy to understand), and inclusive (exclude nothing). A separate ad file that is attached, inserted, or edited into an audio or video podcast. advertising or sponsorship package, or as separate items a lÃ¡ carte. The full text of the proposed standards includes more detailed explanations of the different categories and types of content and advertisements. Detailed info on the proposed standards is now live on the ADM website. The proposed standards are open for 30 day public review and comment. Once ratified, the standards will be reviewed by-annually by ADM.
â€œAs advertisers and podcasters come up with more ideas, weâ€™ll bake them into the standards,” adds Hamilton.